Home > Mobility Solutions > What does a mobile workforce mean for productivity? 13 Feb What does a mobile workforce mean for productivity? Nearly 70 per cent of all currently employed Kiwis would work remotely given the chance, according to a 2015 survey by Horizon Research. Currently, 30 per cent of the country's workforce enjoys this level of flexibility, working from home or other remote locations on a full- or part-time basis. In any discussion of greater flexibility and mobility in the workplace, productivity is a significant concern. So, how well do employees perform when out of the office? For the impact of mobility on productivity, we just have to look across the Tasman to Australia. According to Deloitte Access Economics, the country's economy has benefited from mobile technology adoption to the tune of AU$42.9 billion – a 2.6 per cent GDP bump – in 2015. This boost comes from long-term increases in productivity and a higher workforce participation rate. With a similar rate of flexibility – 29 per cent work from home at some point – Australia serves as an example for similar trends in New Zealand. On average, mobile technology adoption enables 36 extra minutes of productivity each week. Remarkably, the study indicates that flexible working arrangements actually boost productivity rather than hindering it. Survey respondents typically work 36 minutes extra each week thanks to the benefits of mobility, and almost 15 per cent would work less if they didn't have that remote option. "Mobile allows employees to make more productive use of time, work more efficiently with productivity-enhancing tools such as mobile apps, and also allows more people to work, facilitates working more paid hours, and allows people to stay engaged and connected, thereby improving participation in the workforce," said Ric Simes, a partner at Deloitte Access Economics. 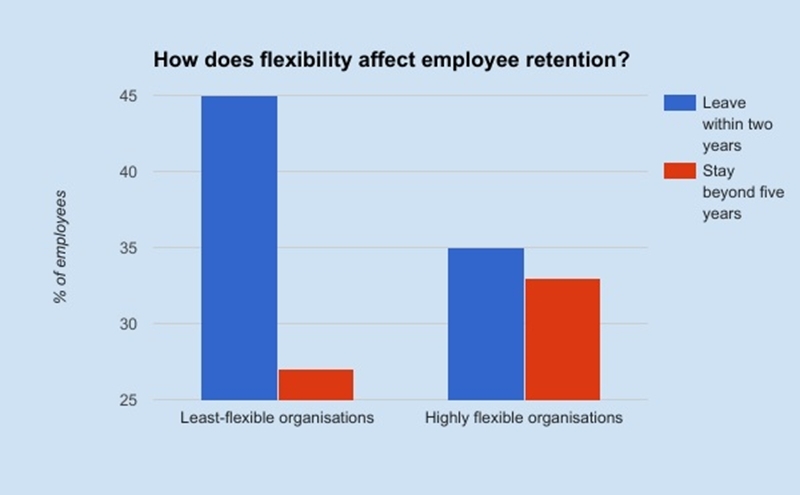 Flexible working arrangements aren't just proving to be financially beneficial, they also play a key role in attracting top-tier employees to a business. According to Ernst and Young, nearly three-quarters of millennial workers want the ability to work flexibly without being stigmatised for it. Answering this demand can pay significant dividends in employee retention. Deloitte's 2017 Millennial Survey found that workers in highly flexible organisations are much more likely to stick around compared to those with the least-flexible employers. Data taken from the Deloitte Millennial Survey 2017. Enabling employees to be more flexible isn't as simple as permitting remote-work opportunities. Organisations must have a plan in place to address a number of factors, including security, network access and approved devices. The team at Imagetext Integrated Solutions can help your organisation enjoy the benefits of greater flexibility through our Enterprise Mobility Solutions. To learn more, contact us today.